"Patrick! Patrick! Patrick!" The San Marcos Elementary School gym rang with anticipation as students chanted the name of one of their heroes, impatiently awaiting his arrival. 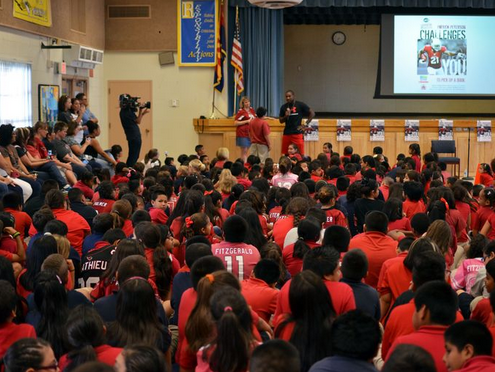 Arizona Cardinals All-Pro cornerback Patrick Peterson showed up to thunderous applause and cheering for the launch of his "Pick Up a Book Challenge," aimed at promoting reading in Arizona schools. "It was almost louder than last night when they were chanting my name," Peterson said, laughing after the event, comparing the students to the crowd at Monday's victory over the San Diego Chargers. 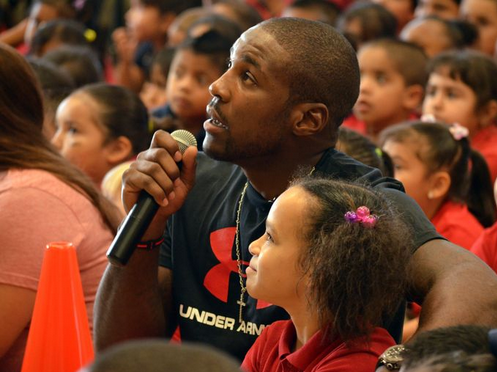 His charity, the Patrick Peterson Foundation for Success, is challenging about 60 area schools to each log more than 100,000 minutes of reading by the end of the semester. Whichever school wins the competition is promised a pizza party with Peterson and a surprise guest he said will be named later. Peterson addressed the crowd of students, parents and faculty, many of whom wore Cardinals jerseys. After reading the audience a story with one of the students, he answered questions and reminded students to work hard in school and listen to their parents. "The kids were excited all day long. We could hardly contain them whatsoever," San Marcos Principal Becky Henderson said. "They were so excited to see him. We're Cardinals fans through and through because that's how we build school spirit, so it was nice to hear him speak, and to see him was amazing." Peterson grew up with four siblings, so he said he enjoys the opportunity to work with children. "Literacy is definitely a struggle here," Peterson said. "Obviously, we want to catch that at a young age. We want to catch that now instead of later." Scholastic, among the world's largest publishers of children's books, is helping with the campaign and has worked on other philanthropic activities with the Seattle Seahawks and Oakland Raiders, regional field manager Chuck Sherwood said. "This is our first venture with an individual player setting up a challenge, and for the schools of Chandler it's an exciting opportunity," Sherwood said. "I think this community needs this kind of support, and it's awesome to have a player step up and challenge the kids in this manner." A Chandler San Marcos Elementary School student joins Cardinals Pro Bowl cornerback Patrick Peterson in reading a story to the assembled school. 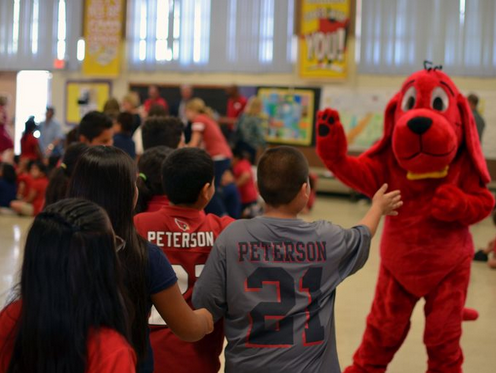 A costumed Clifford the Big Red Dog greets Chandler San Marcos Elementary School fans as they fill the school's gym in excited anticipation of Cardinals Pro Bowl cornerback Patrick Peterson's arrival. 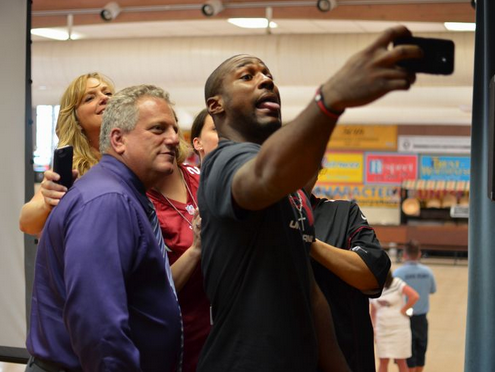 Cardinals Pro Bowl cornerback Patrick Peterson turns a fan's request for a photograph into a selfie with school staff. Chandler San Marcos Elementary School students listen to Cardinals Pro Bowl cornerback Patrick Peterson answer young fans' questions on football, school and life. Cardinals Pro Bowl cornerback Patrick Peterson practices the technique that Chandler San Marcos Elementary School teachers use to quiet their students.